Photos: The Mines Shopping Mall is where you board the Mines Cruise. 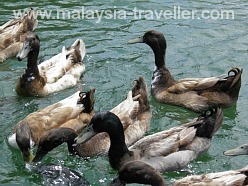 The Mines Cruise is an enjoyable boat ride on two large lakes next to The Mines shopping mall in Seri Kembangan on the southern outskirts of Kuala Lumpur. Mines Resort City was built from the late 1980s onwards on a site which was once the world's largest open cast tin mine, with a massive hole in the ground 2km long, one kilometer wide and 200 metres deep. When mining activities ceased the hole filled with rainwater and the two lakes were formed. The larger North Lake covers 150 acres and is 200 meters deep. 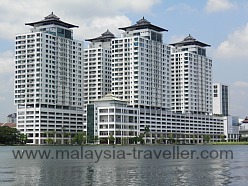 It runs from The Mines shopping mall, past the mines Waterfront Business Park, the blue-domed Sapura Group HQ building and the Mines Resort & Golf Club. 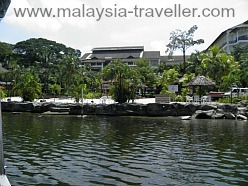 Two smart hotels also back onto this lake: the Palace of the Golden Horses and Philea MInes Beach Resort. The smaller South Lake is bordered by the Heritage condominiums, some luxury bungalows and the Australian School. 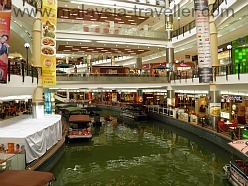 The lakes are connected by a canal which runs through the shopping mall. Both lakes are teeming with fish including carp and large catfish. 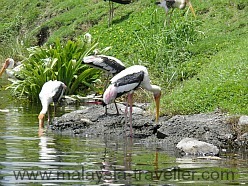 Herons, storks, ducks and monitor lizards feed here. 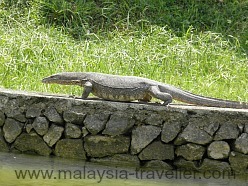 Photos: There is plenty of wildlife to see on the lakes at the Mines, including large catfish, carp, storks, herons, ducks and monitor lizards. Ride & Dine and Massage Cruises are also available. The boat driver stops the boat in various places to enable passengers to feed the fish, birds and ducks. The driver has fish food for sale at RM3 per pack. NB To access the North Lake (Discovery and Amazing Cruises) the boat has to pass through a lock (water lift) by which the boat is lowered 7 meters in 7 minutes. If you suffer from claustrophobia you might find the narrow enclosed lock somewhat uncomfortable (and hot) but it is an interesting experience. 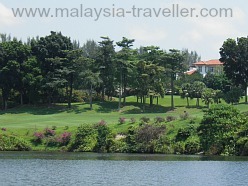 Photos: The boat trip takes you past the Mines Resort & Golf Club (L) and the Heritage Condominiums (R). There are not many shopping malls in the world which have a waterway flowing right through the middle but The Mines is one of them. The Mines shopping mall (previously called Mines Shopping Fair) was looking rather tired until a couple of years ago but it has since been taken over by the Singaporean mall operator, CapitaMalls Asia, who have revamped and upgraded the mall, improved management, installed better toilets, parking and so on. The mall includes a large number of computer and IT stores - they call it DigitaMart and claim it is the largest IT centre in the Southern Hemisphere. It certainly gives the more famous Plaza Low Yat IT lifestyle mall in Bukit Bintang a run for its money. Being less touristy than Low Yat, many say that The Mines has better pricing. For young kids, the mall has a roof top landscaped garden called Splash Park with a children's playground and water play area. There are plenty of places to eat in the mall. Try the durian puffs (stall located near the Mines Cruise ticket counter) for a sweet, creamy Malaysian treat (if you like the flavour of durians). 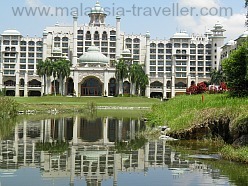 The Palace of the Golden Horses is an impressive looking hotel on the northern shore of the lake. The palatial exterior is similar to the Medinat Jumeirah hotels in Dubai but it is older and, to be honest, is not quite in the same class. It is handy for the golf course. The Mines Wellness Hotel is aimed at medical tourism, particularly of the alternative therapy type, but caters for general tourists too. Both of these hotels have lakeside 'beaches' but it should be noted that the lake is not suitable for swimming unless you want to have your toes chewed off by giant catfish and monitor lizards! Photos: Palace of the Golden Horses (left) and Mines Wellness Hotel (right). Is the Mines Resort City a suitable holiday destination for foreign tourists? No, not really unless you are a keen golfer. 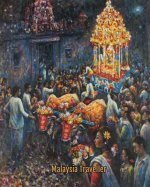 The location is far from most KL tourist attractions and once you have done the Mines Cruise there is not much else for tourists. 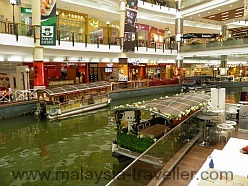 However it is definitely worth visiting for the day for the boat trip and the shopping mall. 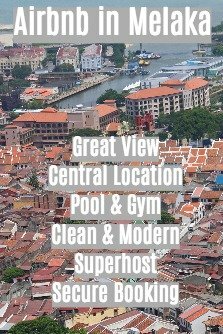 Business travellers who have meetings in the vicinity (or attending a conference at the Mines International Exhibition Centre, MIECC) might find that Mines is a good place to be based to avoid KL city traffic. The location of The Mines is marked on the interactive map on the Top Selangor Attractions page. It is about 20 minutes drive from KLCC, traffic conditions permitting. The car park has been upgraded with overhead lights above each space, green indicating a vacant space. Serdang Komuter station is the closest railway station (KTM line) and there is a shuttle service available from the station to the mall. The Mines Cruise counter is found on Level 1 of the mall. 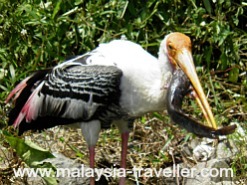 Want to see more of the Top Selangor Attractions? Click here.